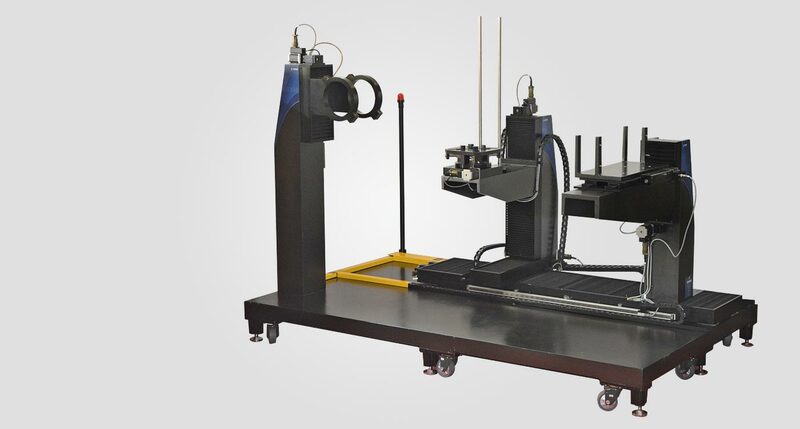 Conventional and digital radiography techniques with multi axis manipulator have been widely used by industries for routine and in-service inspection for non destructive testing (NDT). Automated positioning and movement systems (manipulators) enablequality radiography images with minimum number of exposures. Holmarc manufactures six axes manipulators for X-ray & CT applications as standard products. The system is equipped with six motorized axis and two / three manual stages. On one of the arms, X-ray source (100kgs approx.) can be mounted while flat panel with lead mask (200kgs approx.) can be mounted on the other arm. Both these arms have X-Z movement (300 mm) with accuracy of 50 micron and option to have two more additional motorized axes. At the center of these two arms, the sample stage is mounted with motorized X, Y, Z and rotation stages. The manipulator makes the alignment of the source, detector and sample easy and precise. The position (rotation) of sample and automatically acquired radiography images for each are used to create computed tomogram of objects. Optional features such as motorized shutters, mounts for additional sources and detector etc. are available. We can tailor the system to our customers needs as well.